Issues with replacing Revere Ware lid knobs are probably the most frequent thing we get asked about, and, much to our frustration, one of the most frequent reasons for returns and negative feedback. We figure it is helpful to review all the issues and solutions we’ve come across. First and foremost, the knobs we sell are only for Revere Ware lids. Revere Ware lids have a screw attached permanently, and thus, don’t need a screw. We often get negative reviews for not including a screw. If you want to use our knobs on other cookware, you can, you’ll simply have get a screw yourself from a local hardware store. You’ll need an 8/32 machine screw made of either brass or stainless steel that is between .25 and .35 inches long. Sometimes, a Revere Ware screw can come off the lid. Usually, this is due to rust. The screw on a Revere Ware lid is made of stainless steel. Over the years the Revere Ware original knobs have had various types of metal inserts inside of them with the threads, some of which were aluminum. Putting dissimilar metals in contact with each other can cause galvanic corrosion, and the with the Revere Ware stainless screws and (mainly) aluminum lid knob nut inserts, this often happens. When the screw and nut insert rust to each other, rust can often get between the bottom of the screw, where it is welded ot the lid, weakening the junction. Simply trying to unscrew the knob from the lid and break the screw off of the lid, leaving the lid with no screw. If that happens, have no fear, it is an easy fix requiring only a drill and a new screw from your local hardware store. You can find the instructions here. This is the number one issue we have. Bakelite is brittle by nature, and over time, especially if it has been repeatedly washed in a dishwasher, the nut insert can come loose from the inside of the lid knob and stay attached to the lid. We have a more extensive blog post describing this problem here. The solution is to simply grab the insert with some pliers and unscrew it. In some cases, if the insert and screw are well rusted together, the screw will break off. See the section above on rust. 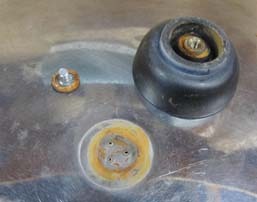 Because of the rust issue (see above), a screw can be left with some corrosion on it that can muddy the threads. Additionally, manufacturing tolerances may have varied over the years such that some screws are just slightly bigger (despite having the same specification). In both cases, a knob can be hard to screw on. If you see some corrosion on the screw, spraying a little WD-40 on it will help loosen the rust and allow the new knob to screw on. If it is just hard to screw on, adding a little oil of any time (one customer used olive oil) will help the knob screw onto the threads. Lastly, on rare occasions we’ve seen a knob nut insert that simply didn’t have the threads. If this is the case, we are happy to replace the defective knob, just contact us. This is pretty rare though; we’ve seen three of these in tens of thousands of knobs sold.